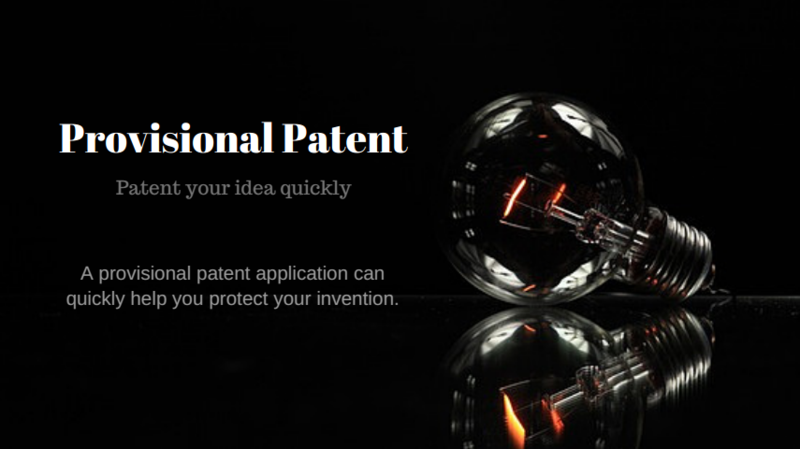 A provisional patent application can help you protect your idea or invention quickly. Provisional patent filing in India starts as low as ₹25,000 ₹ 19,999 + govt. fee. Scroll down for more information about provisional patent. Should you file a Provisional application? Filing of a provisional patent application is the fastest way to protect your idea and gives you 12 months’ time to decide if taking your provisional patent application forward is worth the time and cost. 1. Easier and faster to get a patent application in place and secure the all-important priority date. With the majority of the world following the first to invent system, it is important to file your patent application at the earliest. Given the less stringent standards required for filing a provisional patent application, it is easier and faster to prepare and file a provisional patent application and claim the priority date. 2. Breach of confidentially may not do so much harm. If you are thinking of talking to manufacturers, distributors, investors or disclosing your invention to a prospective partner, you can’t for sure rule out that someone may leak out your invention, even under confidentiality. Signing NDAs is important but you can’t be 100% confident that the information you disclose may not leak out some way or the other. To avoid such cases, if your invention is strong enough to eventually get a patent, it would be advisable to quickly put across a provisional patent application before disclosing your invention(s) to any third party. This will ensure that a disclosure by any third party won’t hurt your chances of getting a patent. Moreover, if someone tries to replicate your patent pending idea, you may still have a strong case against them. 3. Gives you 12 months to explore and test the commercial viability of the invention. Once, the provisional patent application is filed, you get 12 months to test and experiment with the invention and determine the viability of the invention. This time window helps you to ensure that you end up spending money only if the invention shows promise. 4. Reduction in the initial cost of filing a patent. A provisional application can be filed when the idea has reached a stage wherein it can be disclosed on paper. The provisional patent application in India need not contain certain important parts of a patent application like the claims. Since, claims are not required to be drafted and filed at the time of filing a provisional application in India, the initial cost can be reduced. Further, if you are planning to engage a patent agent or a firm, generally the cost of drafting the patent application is also split between the provisional and the complete specification. So, you will end up paying a smaller drafting component upfront and the remaining for the complete around 12 months’ time. Once, a patent application is filed, whether provisional or complete, the patent applicant can use the ‘Patent pending’ tag to show that the applicant is intending to protect the invention as a patent and claim rights over the invention. The ‘patent pending’ tag also acts as a notice to third parties in case of an infringement case after the patent has been granted. However, it should be noted that a patent application can’t be enforced until a patent has been granted. If you want to learn more about the advantage of filing a provisional patent, you can read more here: IPhandbook and Carrferrell. The government fee is a mandatory component and for filing a patent application with up to 30 pages, the government fee is 1,600 for individual applicants, 4,000 for small entity applicants and 8,000 for large entity applicants. In addition to the government fee, professional fee is also applicable if you decide to engage the services of a patent expert. Based on our partnerships with premier patent firms in India, the professional fees for drafting and filing a provisional patent application in India generally varies between ₹22,000 to ₹70,000 depending on the technology area, years of expertise and the type of patent applicant. Based on such partnerships, we estimate that a patent application in India overall costs an average of ₹92,600 (for an individual / startup) and the entire patent process involves 7 important steps and takes 3-5 years to reach the grant stage. Though, performing a prior art search is not mandatory before filing a patent application, it is still a good idea to conduct a search either before or after a provisional patent application has been filed. If the priority date is critical and the applicant is pressed for time, you can get a search performed after the provisional application has been filed. The search is important as it helps to ensure that you don’t end up spending on a patent applicant which doesn’t have a good chance of getting a grant eventually. For filing a provisional patent in India, a provisional specification needs to be drafted and filed. While drafting a patent specification, you need to ensure that all the parts of specification which are necessary for filing a provisional specification are included. Furthermore, your provisional patent application also need to include the corresponding forms. Each of these two aspects are described in more details in the following sections. Form 3 – Statement and undertaking regarding foreign applications. It is important to note that each provisional specification which is filed should include as much information the applicant has at the time of filing of the patent application as new matter can’t be added later. Stage of invention – The stage of the invention generally determines if a provisional should be filed or a complete. If the invention is still not matured, it is a good idea to file a provisional. If the invention is finalized with no expected iterations, a complete may be filed. Initial expense – A provisional patent application is relatively inexpensive as compared to a complete application as the provisional specification doesn’t include all the parts of a patent application and doesn’t require the same amount of time as a complete. Claims and abstract – As opposed to a complete specification which needs to include all the parts of a patent application, a provisional need not include the claims and abstract. Independent existence – A provisional patent application has no existence if a corresponding complete application is not filed within 12 months as the patent application is considered to be abandoned. However, a complete application once filed will continue on its own, provided other actions are taken in due course of time. Foreign filing of patents – Though, both the provisional and complete can be used for claiming priority, however, any foreign application filing like PCT application or a convention application needs to be mandatorily accompanied by a complete specification only. I am interested in filing a provisional, please provide a quote. Representative clients serviced by premier patent service firms partnered with Zatalyst. Our average response time is around 3 hours. Note: On clicking 'Submit' button, it may sometimes take upto 15 seconds to get a confirmation message.